If you desire good-looking and healthy skin, you should consider using a body brush, and not just any type but the best that money can buy. Although looking basic, this brush helps in the circulation of blood and nutrients, removing dead skin cells, cleansing the pores, and eliminating germs and bacteria. It also assists in enhancing the lymphatic functions, relaxing the skin, reducing cellulite and improving the skin’s texture and appearance. However, not all brushes will give you the best results. While some will work, they will feel a bit stiff and irritate the skin. Others are not suitable for sensitive skin, while some types can’t be used in water or when dry. Did you also know that some will flex too much during use or are too rigid and won’t follow the body’s curves and this affects their reliability? All these things make finding a good product tasking especially to users who have never handled this product before. As part of helping you live a better life and achieve good skin, we have outlined the top 10 best body brushes in 2019. Featuring a long 14-inch handle, this blue brush by TopNotch is perfect for your body and skin. It’s designed to exfoliate the skin, remove the dead skin and also cleanse the pores. 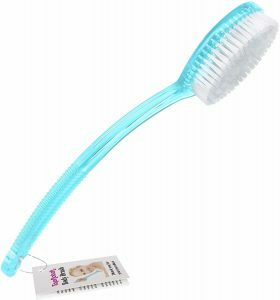 The lightweight brush works with soap and gel and acts as a back scrubber or cellulite massager. It features a plastic handle and moderately stiff bristles that will survive in dry as well as wet conditions. With its 5.6-ounce weight and ergonomic design, using or carrying it shouldn’t be a problem. It, however, will be a little slippery when wet. Make your skin more radiant and your body more youthful by regularly scrubbing and massing it with this body brush from Sublime Beauty. It looks very authentic and classy courtesy of the natural wood construction, boar bristles, and brown color. It’s fairly long, measuring 16 x 4 x 3 inches and will easily reach your back without you using too much effort. It’s very light (4.8 ounces) and features a firm and nonslip handle that has a good grip even while wet. The instructions that come with this easy-to-hold natural brush are however not very detailed. 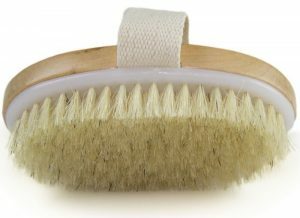 Cellulite will be less visible and your skin more vibrant if you scrub it using this natural wood brush regularly. The 5-inch long and 2.5-inch wide brush weighs about 3.2 ounces and feels light on the hands. It’s made from quality wood and natural bristles that are tolerant to dry skin and regular use. Other than improving the skin’s health, this brown brush also boosts the lymphatic system, blood circulation, and detoxification. Although easy to use, high quality, and durable, the bristles may feel a little scratchy when new or on very sensitive skin. Exfoliating the skin and improving circulation is what this 15.5-inch long brush is designed to do. Many people because of the highly effective nylon bristles that work well in wet and dry conditions and last for long time love it. It’s also tolerant to moisture and wetness since the body and handle are made from a clear plastic material. To make it easier to handle and more ergonomic, it only weighs 3.2 ounces and is perfect for any skin type and works with soaps and gels. The only issue is the handle, which isn’t very strong. 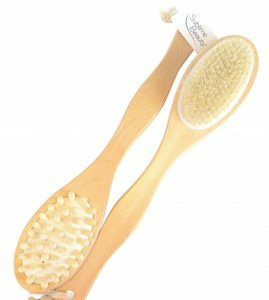 If you closely follow reviews on body brushes, you probably have come by this product by Earth Therapeutics. The brown brush consists of a wooden body and handle and bristles derived from a Japanese palm plant. The two natural materials make it very effective on the skin and quite safe since it doesn’t contain harmful synthetic compounds. It’s also very light and measures 3.2 x 3.2 x 8.9 inches. 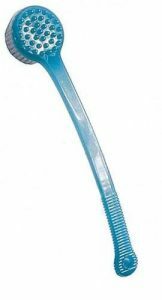 The long 8.9-inch handle offers good grip and reaches whereas the natural bristles work on wet as well as dry skin. Nevertheless, the bristles may feel a bit course when new but this feeling goes away after some time. Breathe new life on your skin but scrubbing and massaging it with the Repsol care body brush. 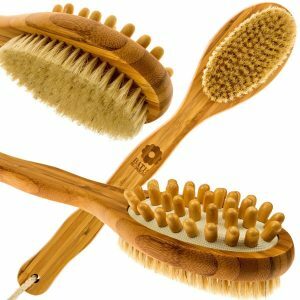 Made from light brown wood and consisting of 100% boar bristles, the brush will stimulate healthy skin, eliminate toxins, and improve circulation. Over time, not only do you get healthy and vibrant skin but also eliminate toxins and germs. It’s 16-5 inch handle can easily reach your back while the 4.3-ounce weight makes using and carrying convenient. You can also remove the handle for storage. However, you should avoid using the body brush with water. Measuring 19-1 /2 inches long, 2.8 inches wide, and 1.6 inches thick, this brush is very effective. Its flexible and ergonomic nature allows the natural beech wood handle to remain firm and is more effective. The head features pig bristles that are neither too soft or too hard and work well on different skin types including sensitive ones. In addition to its lightness (4.8 ounces), good quality, and authentic light brown color, users love the brush because it’s easy to clean and maintain. What some people don’t like is the stiffness when its used for the first time. 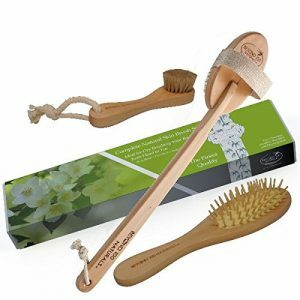 This bamboo-made body brush features 100% boar bristles that make it among the safest and most hygienic products on the market. It’s suitable for dry and wet skin and comes with a long 16-inch handle for easy reach. The materials are also resistant to moisture, soap, and gel, and won’t lose their reliability even after continuous use. If carrying or weight is your concern, you can rest easy because it weighs 8 ounces. Other worthy benefits include the sturdy construction, elegant golden brown color, and the bristles never come out. A number of consumers say the bristles are a little rough on the very sensitive skin. 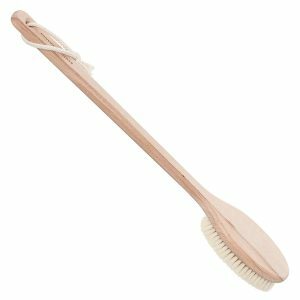 Featuring a Chinese cherry wood body, boar bristles, and cotton material, the SpaVerde body brush slows down aging by improving circulation and enhancing circulation and nutrition supply. It also eliminates toxins, cleanses the spores, reduces marks, and wrinkles on the skin. It measures 16.7 x 3 x 1.4 inches, comes with a long handle for easy use, and weighs about 4.6 ounces. The light brown color gives it the chic appearance while the smooth and polished handle makes cleaning easy. It’s also well-priced and long-lasting. 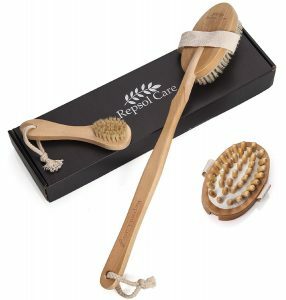 Rejuvenating yourself will only take a few minutes with this brown body brush from Beyond 100 Naturals. It’s made from natural materials including wood and 100% bear bristles for better safety and hygiene. The 13.9 inch long, 3 inches wide, and 1.2-inch thick brush only weighs 5.3 ounces and won’t make your hands too tired. It still offers a firm grip even when wet and the bristles do the thing including eliminating cellulose, detox, and reducing stretch marks. For added convenience and improved portability, the head can be detached from the handle. Although it doesn’t flake, chafe, or scratch the skin, some consumers find the bristles a little soft. Achieving healthy and good-looking skin isn’t as difficult as you may think. You also shouldn’t struggle with accessories that bring little or no noticeable effects. We have listed the top 10 best body brushes in 2019 that will help your skin breathe better, become smoother, eliminate toxins and also make you more youthful. The featured accessories meet the minimum standards when it comes to length of the handle, quality of bristles, ergonomics, durability, and ease-of-use. They also perform well on wet, dry, oily as well as sensitive skin. With these quality brushes, you no longer have a reason for not having healthier skin.